I only managed to spend 24 hours in what can only be described as the crazy city. It fealt like all I did was zoom around to try to fit in as much as possible. The postcard photo chosen is therefore very appropriate. I was amazed how little the horn was used by these people. 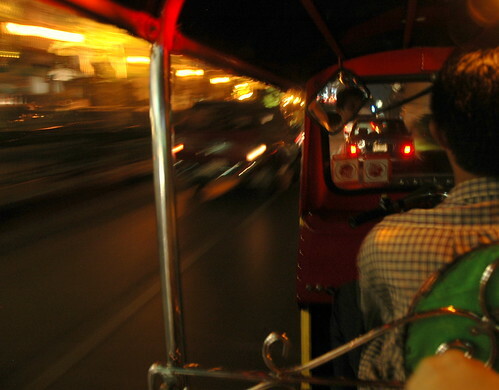 The roads were still noisy – but it was only the more tolerable (and necessary) engine noise. The smiles were many and genuine. People here are very friendly. I will come back one day. Inshallah. 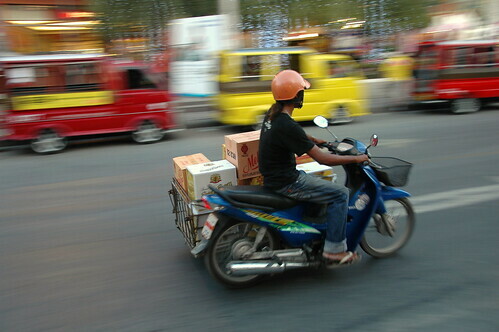 It is so impressive how much the Thai people can fit on a motorbike. I saw a family of 5 on one the other day here in Phuket. The photo is of a man who’s converted his into a delivery truck. This is a very interesting place with many smiling faces. I’m here on business staying at Le Meridien Phuket. What a place! It’s a shame I only have one afternoon free. 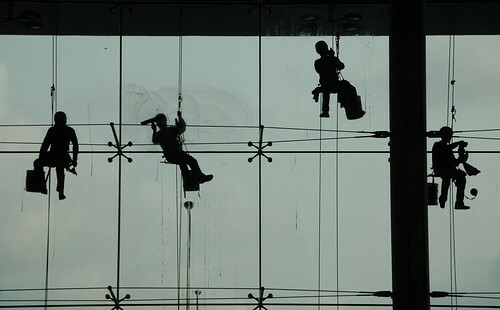 It was fun to watch the show of the window-cleaners at Bangkok Airport. They really looked like they were having a good time, which made everyone at the airport smile.